I have been living in Guatemala for three years between 2004 and 2006, and in 2011 for 7 months in between extended European and US travel. This post is more based on my experience then than now because I have bought my house and this region of Northern Guatemala doesn’t have a lot to offer in terms of expat lifestyle, while it is amazingly beautiful, everything is still priced reasonably and there are few expats. It is growing fast though, three malls and counting! Usually, foreigners live either in the capital city, because they have a job there, in Antigua Guatemala, a nice colonial town 20 miles from the capital, or on the shores of volcanic lake Atitlán, three hour drive away, a more laid back setting. You can find a two bed apartment in the capital for $500-800, fully furnished, in a gated condominium with private gym and pool for the more modern buildings. This was my place in Antigua for a few months, at $600 furnished with all bills but elec included. A three bed flat or house will set you back $1200-$2000 depending on the location and services included. Most rents include water rates and some cable and internet. Electricity is generally on top. In Antigua, rents are about 20% cheaper, although if you want a walkable location expect to pay $600 for a one bed luxury place or a two bed mid range one. 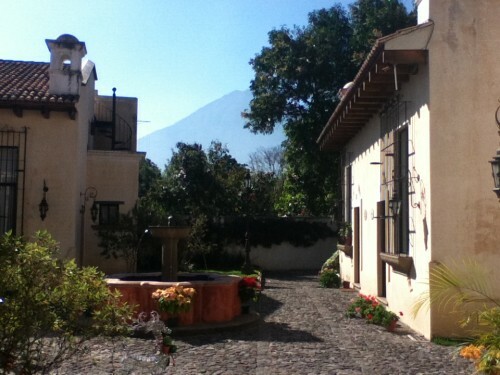 Around Lake Atitlan you can find nice houses with volcano views for $500 and up. All those prices are for properties with Western standards. Most come with a fireplace, colonial furniture, a washer and dryer… You just need your clothes to move in. If you want to rent a local place you can do so for $300/month in the city and $100 in Atitlan, expect no hot water, generally no views, and no services. Food is really cheap here. Our food budget for two is about $200/month or less, but we eat lots of meat, bacon and cheese, and drink our fair share of alcohol. You can cook your meals for less than $1 per person per meal, or go to a local restaurant and have rice, beans, and a little meat for $2. Beer: $0.5 a can. Milk is about the same price at $1.5 per liter. 5 gallon drinking water $2. As long as you prepare your meals, food is very cheap. Convenience food is expensive, whether is is ready meals from the supermarket or junk food. Sometimes you have to pay for water, it is generally a fixed rate of $5 or so every month, most condos have their own well. If you have a meter, expect higher rates, at $40+ per month. Internet is $40 or so per month for a decent package, and $40 for a smartphone plan with data. In the city we paid around $30 per month for electricity, most houses pay much more, $80-$100 because once you reach a threshold the rate gets higher. One of the nice things here is you can hire staff easily to focus on more important aspects of life. My devoted handyman makes $200/month and gets paid 14 months/year. If you lay people off, you have to pay them another month worth of salary for every year worked. Most expats have their own car, gas is $5 per gallon. A public bus costs roughly $1 per hour of travel. There are small shuttles for tourists that take you to all the cool places for $15/$20. You can visit a local doctor for less than $10, but you do get what you paid for. If you go to Guatemala city, there are state of the art equipments, with doctors trained in the US, and procedures cost between 30 and 50% less than in the US. Many people visit Guatemala to get dental treatment or a non urgent surgical procedure like hip replacement or cosmetic surgery. Do your homework before, bad doctors have websites to drag foreign patients too! Dinner for two in Antigua Guatemala will cost anywhere from $10 to $150, there are a few great restaurants with Western prices, although a mid range steak place will cost around $50 with wine. Most attractions are free or under $5, like national parks, volcanoes, museums… and there are lots of free things to do in Antigua. Where we live entertainment is mainly going out to eat and the quality isn’t so good so we tend to eat at home. A hotel night mid range cost around $30, chain hotels in the city $80, beautiful colonial boutique hotels $100-$200 per night. A couple can easily live in a $600 nice house with $50 bills and $200 for food, a $200 maid and $450 for fun and transportation, a total budget of $1,500. Ours is around $1,000 I think (yes, I don’t budget, throw a cyberstone at me! ), but we live in a paid for house. On a related topic, check out the cost living in the Philippines. What do you think? Are you surprised some things are so cheap or expensive? This post was featured on Monster Piggy Bank, Money Bulldog, Life Style Carnival, Canadian Budget Binder, thanks! I definitely need to visit Guatemala because this sounds absolutely awesome! Sending this over to my travel buddy, my sister, right now. Thanks for the insight, Pauline. Gary@Gajizmo.com recently posted..Credit Score Range – What Is A Good Credit Score? it is a wonderful place, everyone who visits loves it. spirit flies pretty cheap to guatemala city. Thank you for writing great things and useful information about Guatemala. I was trying to find information about cheap internet and I found your interesting blog about Guatemala. I am a retired teacher thinking about going back to Guatemala. Do you live in Peten? Do you know where are the best places to buy a home in the capital or in Antigua? It doesn’t surprise me that things are pretty cheap in Guatemala. But I do recall a few articles that you did where you highlighted the downsides of living there – like the fact that it can be really dangerous. I would also imagine that you don’t live close to a lot of amenities or have access to anywhere near the number of goods and services available in generic midsized town in the US. So to some extent, I think that you get what you pay for. My Financial Independence Journey recently posted..A Brief Primer on REITs (Real Estate Investment Trusts) Part 1: What are REITs, why should you invest in them, and how do they compare to being a landlord. Yes, there are some security issues mainly in Guatemala City with a high crime rate and some street violence, my region in the North is quite safe, although there is poverty so displaying decadent wealth would just be stupid. I am 30 minutes away from a hospital, 20 minutes by boat, 40 min by road from an international airport, 10 min from the bank, butcher, bakery and basic shops, 30 minutes from the mall where you find most things, a larger choice of foods, domestic appliances or medicines. Now rare are the things that I miss, like cheese or good wine for example, and I make up for it with delicious vegetables and veggies that are hard to get in Europe. “modern” things like computers or washing machines you have less choice and they are a bit more expensive so you do pay premium for that and can’t be too picky. On daily items I barely feel that I am missing out, the cultural life and night bars are replaced with Mayan ruins and natural beauty so it is like living in the middle of nowhere in the US, not in a medium town. Mrs. Pop @ Planting Our Pennies recently posted..What To Do With A Car Accident Settlement? Mexico is a bit more expensive, mainly for labor and food. Housing can be ridiculously expensive in Guatemala compared to Mexico but there is a smaller offer for quality housing, and the places are very big. We used to rent a 1,100 sqft house that had just one room, in Europe they fit 4 rooms within that space. retirees love it there in Guatemala, there is a spring like climate most of the year and access to the US or Canada is really easy. Honestly, I think that we would probably travel the world and live a few different places if we didn’t have children. Had we realized this in our 20’s we probably would have. Guatemala appears to be relatively inexpensive, though the gas is a bit more than we pay here. Still, I’d probably just walk or use a bike more. there is a family living there with 5 young children they blog at discovershareinspire.com, their journey is really interesting about how the kids learn around the world. They were supposed to go all the way to Argentina but loved Guatemala so much they just bought some land here! Awesome article Pauline. I’ve never been out of the states (a fact that troubles me). I’d love to travel and see various places, but I’m also content living wherever I am. Those prices are great. I’d be really interested in seeing how cheap The Cash Cow Couple could live there vs. here. well if you don’t mind where you sleep (basic, clean accommodation) you can get a place for $150 or $200, and many people live on $200/month for basic expenses so $400/$500 you should make it. It is very cheap but you don’t get coupons or special offers, so anything a bit fancy you pay full price for. This doesn’t seem that bad. There are some prices that are pretty comparable to where I am at in the US. The thing that I like is the cheap beer. I want some $0.50 cans of beer. It does sound like you can do well there to stretch a dollar. Thanks for the breakdown Pauline. Canadianbudgetbinder recently posted..A Love Letter And Life Lessons: Money Fool To A Budgeting Money Saver! I like that I was able to hire people to fix my house so quickly but on a regular basis don’t like having people around in my private space. I think after all is done they may stay part time. Guatemala is really amazing, hope you can visit! gas is freaking $7.5 in Paris at the moment!! Ok, but my first question is how much are diapers? Haha, kidding. Kind of. I would love to have a $1000 per month budget. Plus it looks beautiful. I’m glad you’ve found such a nice, affordable place to live. Thanks for sharing! mmm would have to check that one out! I’d say if you go for pampers, about the same as US prices, with no option for coupons. The local stuff has to be less expensive. I love the cost of avocados (since I eat so many) but gas is obviously more expensive. I think it’s a place I could visit, but probably would have a hard time living there because I’m just not that adventurous. I think the one issue that would scare me a little is the violence there…but hey I live not far from south central LA so that could be an exaggeration by the media. the media love to pick on Guatemala and CA in general. The gangs originated in LA then deported the gangsters back to Guatemala where they created local gangs. They do kill each other for stupid reasons and rob a bus on a regular basis but there are zones you learn to avoid and most of my friends in the capital city have been robbed from their cell phones once or twice but that is it. I was robbed from mine once… in Paris. What surprised me most prices you were describing as expensive. Maybe expensive locally, but in line or even cheaper than in the US. I can’t get cheese for $5 unless it is fake, processed stuff. yes, prices are very relative, when you are used to paying $0,12 for a pound of bananas, $5 for a pound of cheese is expensive, whereas when bananas are already $2 a pound, cheese seems like a better value. One of my dreams is to live and travel abroad 🙂 Great example! What other countries have you lived at? I have lived in Paris, Marseille and Aix en Provence in France, then London, Barcelona and Casablanca, Morocco! Very interesting! My wife and I sometimes talk about living somewhere with a lower cost of living…we’re in NY! But, I don’t foresee leaving because of family/jobs. We were in Honduras a few years back (where my wife grew up) and saw a decent amount of expats there, especially in the coastal areas. Cost of living was less, and some cities seemed safe, especially the touristy part. But she’s from the capital city and yea, crime is definitely an issue. If we had more time, we would have liked to go to other parts of Central America. Yes the capital is not ideal but you can live on the coast and go visit family often in the capital for a few days. I used to think I couldn’t leave Paris because I had to be near family, in the end we talk just as much with skype and when I visit I do enjoy their company, whereas when we were close by I would rarely visit anyway. Long-time reader, but first comment here. Loved the post! I’ve been to Guatemala and most of Central America. My greatest concern is my two girls… any thoughts on schools and raising kids? I’ve also read about and visited Nicaragua — any thoughts on comparison? I know it’s a lot different touring than actually setting up a life in a foreign country. My wife is from Venezuela, and she is surprisingly set on not living in Central or South America, but I do believe I could leave tomorrow for 4 or 5 destinations that immediately come to mind. It always remains in the back of my mind. I retire from the US Coast Guard in 5 years with a great pension. I know there are a lot of Central American countries that want those pension dollars spent in their countries and actually offer a path to citizenship…. have you run into anything like this? Hi Patrick, thank you for the comment! Regarding schools, Guatemala has pretty good private schools that offer a bilingual program. In Antigua Guatemala the main one is called Boston and in the capital you have the American school that follows the US curricular. Otherwise the kids would have to pass a test upon returning to the US. Many families choose to homeschool, you can check discovershareinspire.com about that. They live in Guatemala with five young kids. Nicaragua I have only been once and I think life would be a bit cheaper but less diverse. In Guatemala you can climb a volcano in the morning, have seafood by the Pacific ocean at lunch and then come back to soak in thermal waters in the evening. Everything is close by and the Mayan culture you won’t find anywhere else in CA. Another option is medium town, Mexico, places like Querétaro or Guanajuato offer good schooling, are safe, clean, and have a strong middle class so lots of cultural and recreational offers. You can rent a house for $800 to $1,200. Belize has an easy visa program, check http://www.thefrugalfarmer.net/?p=1084 but you have to want to live on an island, the coast isn’t that great. Guatemala is a bit picky, but any lawyer can help you, or if you go out of the country 2-3 times a year to dive in Honduras, or visit Mexico, or back home you can stay on a tourist visa. Wow! thanks, Pauline. Great information. I am thinking that I will have to spend a solid month or two down there when I’m out. I love Belize, but you’re right — the coast is not so great. Guatemala sounds great, and it’s the Central American country I’m probably least familiar with. Anyway, thank you for the response and the consideration. Much appreciated. no problem, happy to help. It would be great to go down there sometime, just for a couple of weeks, and see if you like it as a holiday destination, if so you can spend a couple of months making sure daily life would be just as nice. 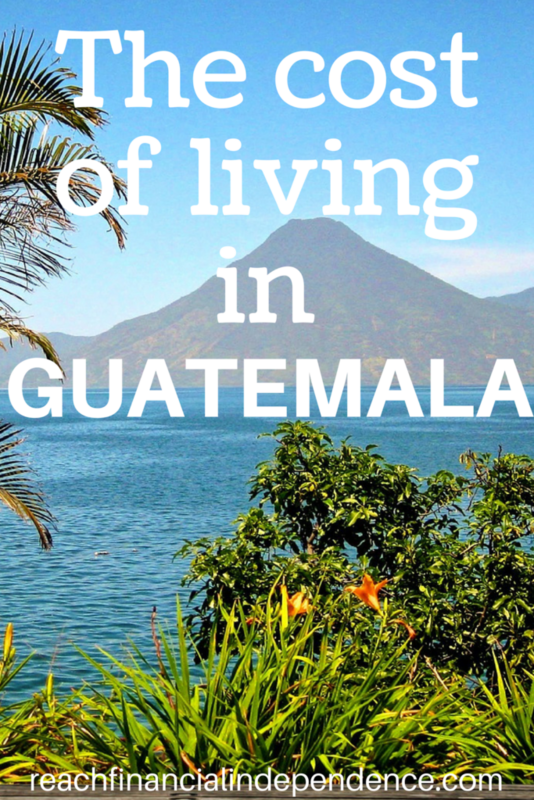 And you can check out expat forums to see what other foreigners think about Guatemala. Very interesting seeing the breakdown. We plan on traveling quite a bit when we retire but we haven’t really decided if we actually ever completely relocate. With our family back home, we lean towards no, but it would be great to stay a few months and really get to know an area too. Seeing such affordable prices makes it a real possibility. Some retirees opt for 3 months in Guatemala in winter, and just rent a furnished place as a base camp to explore from. Other own and come for winter then spend summer in the US. 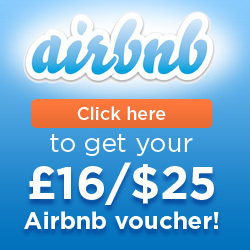 If you rent you can find a new destination each winter which is pretty cool. Lake Atitlan looks amazing! I visited Tikkal and Flores a few years back and absolutely loved it – so laid-back and a great value. I’d definitely like to visit Antigua in my lifetime, especially since lodging is so inexpensive – thanks for the cost breakdown! anna recently posted..Car Repairs, You’re Not the Boss of Me! I am 20 miles away from Flores and Tikal, on the shore of Lake Petén Itzá, it is a wonderful place. In Antigua you have $5/night dorms, $10 privates and $20 double rooms with a small breakfast. They change all the time but a quick tripadvisor search will tell you the best one of the season. I would say generally I’m not surprised. I would think that housing would be a bit cheaper for Western standards, but overall it seems reasonable. I do like that you can hire the extra help for a low cost, that’s one of the things that is difficult in the US. You need a decent income to hire a full-time nanny, since they will run you $1,600-$2,500/month at the conservative end. for housing if you want a Western house with walk in closets, pantries, each room with its own bath etc you pay around $1,000/sqm or $100/sqft. buying/renting a humble local home with small rooms is much cheaper. I figured things were cheap in Guatemala, but I didn´t think it was that cheap! The cost of living on the Canarian Islands which I´m accustomed to other than North European, is the cheapest I´ve ever come across, but Guatemala is definitely a lot cheaper!! Yes, it is a bit cheaper, and similar to Turkey or Morocco. If you want cheaper you’ll have to try Asia! I can see why ex-pats and retirees move to Latin America. I would live like a King on just my Social Security. krantcents recently posted..Is There Right Time to Buy Real Estate? having help to cook or just take care of you is the big plus for retirees, and now that Spirit flies for around $250 round trip it is affordable to go home once or twice a year as well. Some of the costs do remind me of our town in the middle of nowhere, essentially. We also have to drive at least 30-60 minutes for more amenities, but the outdoor aspect more than makes up for it in my opinion. Labor is less, gas is more, but it’s pretty similar. It also seems that if you want Western standards, you pay Western prices, which would encourage me to get out of my comfort zone and live like a local. When I’ve stayed with locals in Costa Rica, no one had hot water, air conditioning or clothes dryers, and it was just fine, although I do like a hot shower! Lastly, when my house if paid off, I might give up budgeting as well. Oh, and when I’m ready for my tummy tuck and face lift, I’ll have you find me a good doctor! that’s right, if you live like a local, life is pretty cheap. I do enjoy a bug free house, a bed with clean linen instead of a hammock, and a source of protein every couple of days in my meal, those are the cheap luxuries, and most foreigners live a little bit above the local average. We do have an electric hot shower but rarely use it either, it is too warm outside. Then if you want cereals for breakfast or a pair of Nike you do pay Western prices. Will any place serve craft beer? How much is that? I have priorities as you can see. $1000/mth budget sounds incredible. That could be fun! And looks from your adventures like it is. cj recently posted..Yezzzzz…our new book is FREE! there are two big breweries and I don’t know of other small brewers. You can get other imported beers like Guinness for about $5 per pint in a few bars. And yes, Guatemala is a lovely country, if you are looking for a nice weather with plenty of cultural and natural things to see, this is the place! Seems like a pretty nice area, I would say most of those prices are similar to around here in Ohio, except for the gas which is in the $3.50 a gallon range for us right now. I know, gas is super cheap in the US. At the moment in France it’s around $7.50!! I’m actually surprised as to how comparable lots of the costs are from here to there. Except food – that looks to be a lot less expensive. And beer. I have a neighbor who is employed in IT and commutes every 5-6 weeks to the US, best job ever! Ok, I think that CJ and I were thinking the same thing because we both ended up in the closets reaching for the suitcases after reading this. 😉 Wow, seriously though, the natural beauty and affordability really make a great sell for Guatemala! I wanted to say that your willingness to share is so very much appreciated. I loved reading Patrick’s comment and your thoughtful reply. Love that!!! Tammy R recently posted..Yezzzzz…our new book is FREE! Thank you for your kind words Tammy. I am sure you would love hiking up an active volcano to watch the sun rise then go down to dine in a colorful colonial little town and explore its cobblestone streets, Guatemala is so diverse there are things to please every one. Yes, one would not have to twist my arm too hard to get me to do that! That sounds…beyond words. Life is good with house help! You can easily focus on family and romance with out bothering about the chores. I wish I can save more money and transfer to another place where the dollar has more purchasing power! Thanks for the informative article! I am looking into anywhere in South or Central America with a cost of living that is about a third what it is here. Guatemala is definitely on my list, but I am surprised the rent seems so high? I pay $450 now for a rather large room in a large 6-bedroom house, and that includes electric, wifi Internet, washer/dryer, bathroom shared with one other girl, and yes hot water 😉 which is a pretty good deal for Eugene, Oregon. I have lived alone in a one-bedroom and it costs closer to $650-800 for the same amenities. Do you think there are options like that down there? And would the cost still be similar? A few other quick questions: cell phones – I am used to having a smartphone with constant 4G Internet connection… How is that down there? How is the wifi Internet in general? And can you watch Netflix or Hulu? Or download e-books? And can you order stuff online and have it shipped, like from Amazon.com? Like a computer, or a book or whatever? 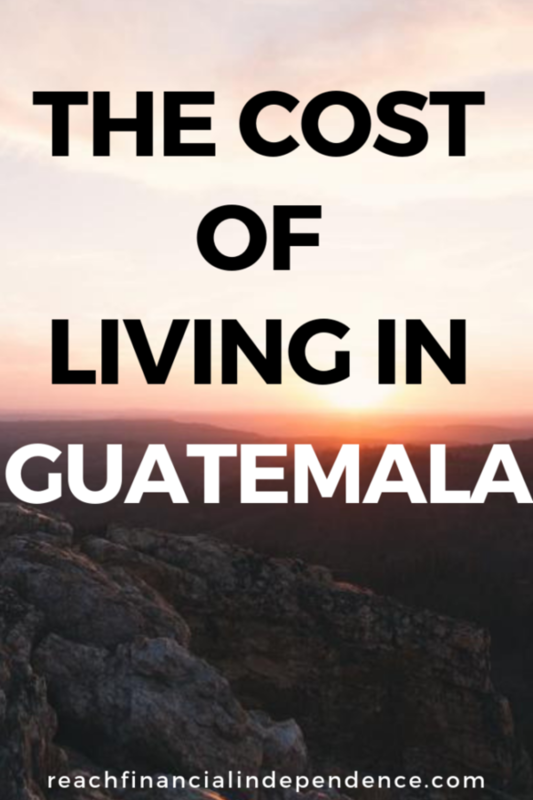 I have another post coming up this week or next about the cost of extreme living in Guatemala. You can rent a basic house for under $100, and you can find a nicer houseshare for $150 or $200. What I rented for $600 was a lovely furnished colonial condo, well located, with all amenities, gardening and cleaning service, etc. If you go basic you can get housing for under $200 easily. google revue magazine guatemala, they have a few rental listings. Smartphone with internet is about $50 a month, it is not cheap because there are less customers than in the US. I pay $2 for 24 hours of internet and 1go download so I download a movie or ebooks but I haven’t tried to watch hulu. If you have stuff shipped it needs to look used or you will have to pay taxes. Better have amazon free shipping to a friend who will remove packaging and ship to you like it is your used stuff. But things get there with no pb. Nice blog. Very informative. I am seriously considering to spend a few months in Guatemala. I like your estimate of the cost of living in a Guatemalan countryside, but would I get the chance to learn Spanish if I live in a small town? That’s primarily why I consider traveling there. as a US citizen you get 90 days and can renew once so she can stay 180 days. After that she has to apply for a 2 year residency which costs about $300, or go home for a while. I am a Canadian five years from retirement and expect to be living on a government pension of $16,000 a year with no savings. Im wondering about language. Is Spanish a necessity or do many people speak English? Also, Ive heard Latin American countries look down on gringos. Is this true? Will one feel that? Hi Alexander, are you wondering if your pension would be enough to live in a place like Guatemala? Certainly. You can rent a $400-500 nice place, or even a $150-200 room if you are willing to share with others, in a big house. You can have a comfortable life on $1,000 a month, even with cleaning services and eating out quite a bit and save $4,000 for a trip back home every year. I don’t think your cat will be a problem, however I bought my dog here so I am not familiar with importing pets, it shouldn’t be a problem if you have his health record. Spanish is a necessity if you want to interact with people, but for most locals it is their second language (after a maya language) so they speak very clearly, slowly, and are very patient if you try. There are many Spanish schools offering 20 hours a week for $100 or under, $200 if you do a homestay with a local family, doing that for a month would set you up for basic conversation, buying things at the market and asking for directions the rest comes with time. In touristic towns people speak English but it is not the norm. They don’t look down on gringos, sometimes they can get a bit resentful that you have so much and try to take advantage by inflating the prices but otherwise people in Guatemala are very friendly and welcoming. I have never had a bad encounter with someone due to my being a foreigner. That happens between gangs, for drug related problems mostly, and outside of Guatemala City you seldom hear that kind of stories. In ten years of living on and off here I have only met one girl who got a missed bullet on a bus but she traveled late at night on a dangerous road. If you respect the basic safety measures of not displaying too much wealth, traveling by daylight, etc. everything is fine. Actually my house doesn’t even lock (don’t tell the neighbors!) and nothing has ever happened. Oh, sorry, also… I have a two year old cat. Wld it be hard to get him into the country? Are there any daycare facilities with western standards? We plan on visiting Antigua for a month with our 17 month-old. Hi Dennis, yes there are, although I am not familiar with the ones in Antigua. In Guatemala City there are plenty of modern daycare centers, some of them bilingual. Another option is to hire a part time or full time nanny to stay at home with your kid, and she can come along if you travel around. They cost around $15 a day, most houses and apartments have maid quarters, in which case you would have to feed her as well. I have been to Guatemala several times in the past and yes Antigua is awesome. Now I am 65 years of age with a wife and I only get Social security and not enough to live on here in Utah. Our children are all of age now and I am considering living in Guatemala or Costa Rica. This way we will not have the beg for food stamps, etc. The weather in Antigua is the best I have ever seen and I speak a little Spanish. Yes, Antigua has an amazing weather but it is one of the most expensive places to live if you consider retiring in Guatemala. There are other nice villages in the highlands with a similar climate at a fraction of the cost, the negative being that the expat community will be more spread out and you really need to learn more Spanish to get by, but people are always friendly and happy to help. Guatemala is great to retire on a budget, and you can often fly Spirit for $400-ish return to Las Vegas then make your way to Utah. I’m in the same boat – if I retire at 65, I’ll have an income of CDN$16,000 per year – and was also considering Guatemala, as well as Peru, Thailand, and Nepal, but the thing that scares me about Guatemala is the cost of hiring a professional hit man – $500. Seems very easy to knock someone you don’t like off there! Also Guatemela has been implicated in genocide of the natives. Dear Alexander, I’m not sure why you fear someone having you kill for 500 US. dollars, they will probably do it for 50 dollars if there’s a good reason, the thing is people have no reason to dislike you, being a gringo or a white person in Guatemala is more common that you think, people are very friendly and will help you out if you’re trying, every now an then you hear a foreigner got robbed or mugged not very often but it happens, but this happens everywhere including your USA, common sense goes a long way, with a budget of 16,000. a yer you can have a phenomenal life in Guatemala, don’t be scared or you will miss out on the world, Im from Guatemala and have not ever been mugged assaulted or witness such behavior, now i’m not saying it does not happen, it does but foreigner are not a target, that’s what I’m trying to tell you. good luck. Hi Pauline, good article. However the housing prices sound comparable to Greensboro, North Carolina where I live. Its a mid sized town in the middle of the state. The bigger cities in NC (Raleigh and Charlotte) are probably a 10-20% more expensive. I imagine people living in California or NYC would love the lower cost, but they can find similar in Smalltown, USA. My son moved to Antigua about a week ago. He is with a group of people who are part of a small start up company (young adults sharing one big house!). Its an experiment to see if they can do business there with their existing US customers and make more money due to the exchange rate. I plan to visit him (them) in a few months. They have a spare bedroom for all the relatives and friends who have already promised to visit. Its a fun adventure for all of them. Regretting that I didn’t do something like this when I was in my 20s. Your costs are pretty dead on! I found Guatemala to be quite expensive if you want the comforts of home. If you live like the locals it is not bad. The biggest discount is labor. Very nice post. I like the helpful info you provide for your articles. I am a little late to the party, but just found this today. I was wonder if you are restricted on things to buy or do if you do not speak Spanish. I visited Guatemala City and one day in Antigua a year or so ago, fell in love with the people and the place. I have been thinking of moving to Antigua, heard it was friendlier for English speaking people. I am retired and on SS, running out of money living in the states. Thanks for the article, it was really great, loved all the comments. ha, let me know! Tikal is amazing. There is some wind but I haven’t seen windsurfs so far. People are more into jet skis which I don’t like because of the noise. The wind blows always on the same side, I’m not sure you can come back to where you came from, but not an expert..
Great information! What kind of living could an American couple make in that area in terms of jobs locally? Depends on your line of work. English teachers make anywhere from $5/h to over $2,500 a month at international schools. 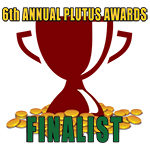 I have friends in mid level management for big firms making $5,000+. If you’re just in a call center you can’t expect more than $700. Your best bet is to start your own business, with guest houses and restaurants being a favorite for expats, but also wedding planners, photographers, and a lot of businesses that don’t exist here but are popular in the US, or freelancing online. After reading this I am somewhat surprised by the cost of living there, I thought it would be a little more. I’m really surprised, however, to learn that you can actually own property there. Land, home, development? That’s something to think about. I always pictured myself retiring in Guatemala and you make it look possible. Thanks! Just talked with a friend who spends some time every year helping an orphanage in Guatemala. My son is over a large school district computer technology department. My son said he would get the school district to donate all their older lap tops and computers to the orphanage. Our friend Johnny just told my son, ( Jon), that he has been invited to down there to give the computers to the orphanage. I am a little worried about his trip there in June, should I be? I am a 66 yo married 42 years to the most wonderful woman in the world. I’m a retired Fire Marshal, previously a fireman/paramedic, Fire LT., Fire Capt., Fire Deputy Chief over operations, then Fire marshal from a suburban town of Dallas Texas. I have built new homes, taught Tennis, and a little golf. My wife and I have always built our homes, a new one every five years or so. I can frame a house or teach that. I have always been about doing things that make a real difference. Do you think there is anything important that I could do in Antigua? How hard is it to get grass fed, organic, antibiotic free meat and poultry? Is it expensive? Firstly I would like to thank you for sharing your views on THE COST OF LIVING IN GUATEMALA. I was looking for the same blog. The pictures you used in this are amazing. Please post some more blogs related to “Tropical yurts & resorts in Guatemala” so that every visitor could plan their trip & find easily the best yurt or resort to make their vacations memorable. Thank you for your wonderful post and advice. I am considering moving to Guatemala City, Guatemala for a job at an elementary school called CAG . What can you tell me about life in that area? Crime/danger, fun things to do, see, and explore, food, culture, cost of living, and anything else. Thank you! That area is super safe but very residential so a bit boring to live nearby. You can get a nice apartment with gorgeous views of the city close by, but you’ll need a car to go out to socialize and shop. Zone 10, 14 or the Vista Hermosa area are about 15′ away by car to get to work and you’ll be against the traffic in the morning. The first two have walkable areas and are very safe, the third one has nice green areas to go jogging but it’s harder to walk to shops and restaurant, depending on where you are in Vista Hermosa. Things to do and see will depend on what you like, but there is plenty for all tastes. Antigua is 45′ away and a nice weekend break, the beach is an hour away, etc.